Holbrook House front yard with picket fence. Living Room with love seat, four chairs, desk and large TV. 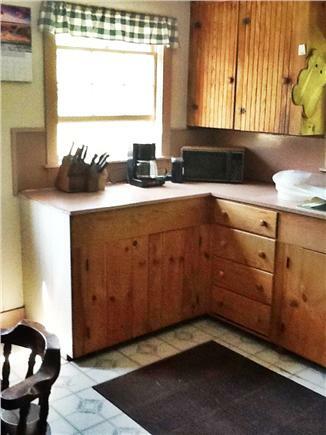 Kitchen with New Microwave, coffee maker, table, grill outside. 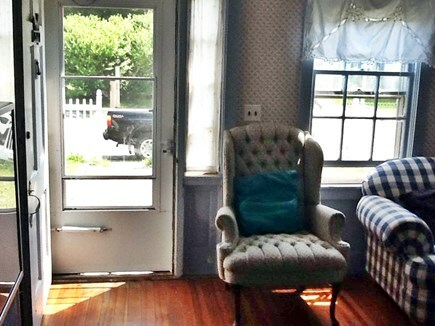 A relaxing stay near the center of Wellfleet. 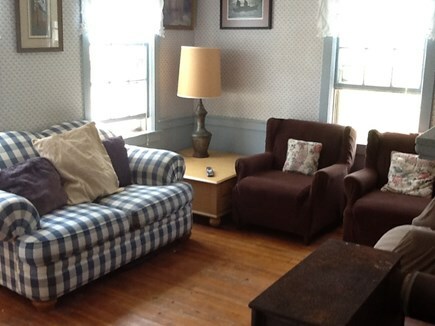 Our home is conveniently located on a sunny corner two blocks from Wellfleet's town center. The house boasts four bedrooms, a living room, kitchen and fenced front yard with a gas grill and picnic table that seats six. Our WiFi and cable are high speed and fully loaded with powerful Xfinity signals to ensure connectivity throughout the property. The kitchen has a round table (with extra leaves) with four chairs, A gas stove, a microwave, coffee maker, and plenty of cookware. The refrigerator is side by side doors with water and ice (crushed/cubed) in the door. The house is great for family entertainment, with a large front yard for kids and pets. Our basement is a full size basement, with access to our top loading washer and dryer and access to the Outdoor Shower and back yard. There is one larger TV in the living room with several chairs and a love seat. On the first floor one bedroom has a king size bed and the other a queen size bed. 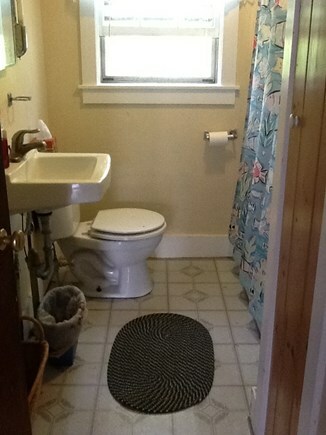 The bathroom with Tub and Shower is on the first Floor. Both First Floor Bedrooms and the living room have ceiling fans and window fans. The second floor bedroom on the right has a sitting area with a futon, coffee table, TV and DVD along with two twin beds. The other bedroom has a Queen bed and a twin captains bed. 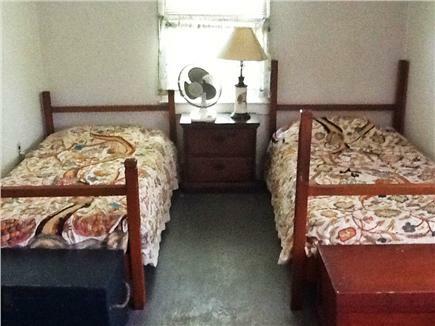 All bedrooms are stocked with extra pillows and blankets, and extra fans. Powerful Xfinity WiFi service is upgraded every year. Wellfleets' beaches, markets, restaurants, fish markets, grocery stores and even bay beaches are easy to walk to from our home. Additional availability info: House can be rented for months and or weekends depending on availability. This is a Sunday to Sunday vacation rental. Additional pricing info: Save $300 off original prices!, State and local taxes of 12.45% will apply. 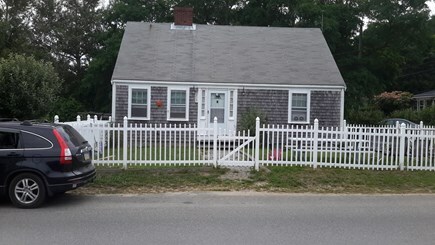 I've never written a review on WeNeedaVacation (or really any website like that) but because I depend so much on them when making a decision for a Cape house, and the fact that this house has none (except for the dreaded homeowner entered) I thought I'd share. To start off, I don't know that I've ever rented a house or gone to a restaurant or done anything when I can't do my due diligence through reviews. I took a chance on this house as they didn't have any, and I'm so glad I did. While the weather was truly pitiful (was only sunny for part of one day, while rained the other days, never reaching a high of above 55), the house made up for that because of the location. In my opinion, this location is second to none other than being right off Main St in Chatham- and honestly, could be even better. While we didn't have a proper beach day, we still spent our days walking and exploring the area. Whether it was walking to Hatch's Fish Market, Mac's Shack (best restaurant on the Cape in my personal opinion), the Pier, the Marsh walk, walking and awing over the old gorgeous homes of Mill Hill, Briar, Railroad, etc.- we made use of our entire long weekend in Welfleet. We went to a wine tasting at the liquor store right around the corner, bought some jams from the stand right up the street on Rt 6, walked the dog down to Town Beach most nights. If you are a dog lover, and HATE to travel without your dogs, then this house is an absolute must. The fenced in yard was just perfect. Our dog is a rescue and never had proper training from a puppy on staying close by, so it is a very rare occasion we can have her be off leash. The fenced in yard was a real treat for all of us, including our dog. The interior of the house is the reason this house is probably such a steal for the unbeatable location. I'd love to see the owners make some small updates, like repainting some areas and maybe replacing a few of the bed comforters. My bed was actually very comfortable (the downstairs king) but the twin mattresses upstairs seemed very thin, so probably best for kids. The living room was very comfortable, though- with lots of comfortable seating. 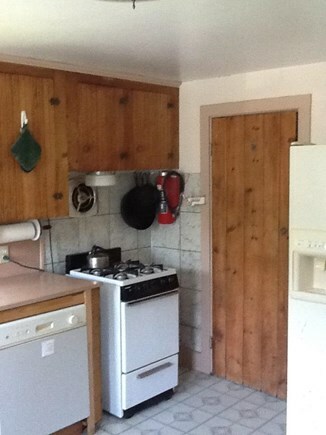 For an old house, it was great that they had a dishwasher, and even though the stove is very small, loved having the gas and was excellent to cook on. They also had a fully stocked pantry of cookware which can be hard to come by in Cape rentals. We didn't find the eat in kitchen table to be very inviting, so ended up either eating our meals out at a restaurant or on our lap in the living room. One early evening that was mildly warm (50 degrees) we did eat outside, so if you rent over late Spring or Summer, I imagine that's where people spend most of their time. It was also great to have so much parking! We had guests come and go throughout our stay, and never had to worry about where to park, which is excellent for such an in town location. It says there is an outdoor shower, but the surrounding area needed to be cleaned out for use (overgrown grass, etc). I imagine that was only the case since we were the first renters of the season- and wouldn't have used it anyway given the weather. Something we didn't realize was that there was no laundry- which was incredibly tough with a 1 year old. Our fault for not seeing that in the listing- but it wouldn't have stopped us from renting, or renting again. Just something to plan for. We have since updated the floors in the kitchen and bathroom, painted two bedrooms, added a larger dresser, added new coverlets and are putting in a larger stove. The access to the basement is difficult to see because it is a door in the hall. That is how you get to the outdoor shower and washer dryer. We have put sign on this door. We have removed the glass table and added a second picnic table. We'll keep improving the house as we want our guests to love it as much as we do! We stayed in Holbrook House for three weeks in August. The house has plenty of room for our family and the few friends who came to stay over the weekends. It is close to the town center and also the harbor. There is plenty of parking and the large fenced in front yard is great fro evening relaxing. We rented the Holbrook House for 1 month. We enjoyed walking our dog down to the harbor, enjoying a lite dinner at the Bookstore restaurant or the Pearl or Even Macs and then walking back by way of town. We would visit many shops and sometimes stop for dessert up in town. A very convenient location,. We also enjoyed the front yard and the grill. Holbrook House was a nice vacation home for us.